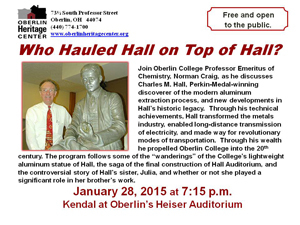 (Wednesday, January 28, 7:15 p.m., Kendal at Oberlin) This talk about Charles M. Hall, who discovered the economical process for refining aluminum metal, will focus on "new" developments in the Hall legacy. Inexpensive aluminum metal transformed expectations for the appearance of metals and enabled huge electrical networks and modern modes of transportation. Hall's wealth propelled Oberlin College into the 20th century. We will begin with the performance of a little-known song, "Who Hauled Hall on Top of Hall?" that was written by Oberlin College students at the time of the dedication of Hall Auditorium in the fall of 1953. Accounts of other wanderings of the lightweight aluminum statue of Hall will be woven into the talk. The saga of the final construction of Hall Auditorium will be revisited. An ever-expanding myth, which Alcoa has now embraced, that Hall's older sister, Julia Hall, played a significant role in the discovery will be evaluated. We will "visit" a modern aluminum smelter.